These yummy nutty delights are a perfect healthy option for snack time. Get creative decorating these nutty treats with your favourite toppings. In a food processor, blend together the almond butter and dates to a fairly smooth paste and it begins to come together into a ball. 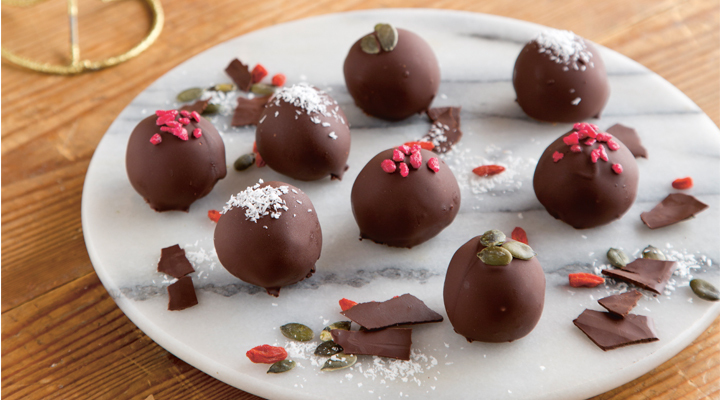 Add the goji berries, pumpkin seeds and desiccated coconut and blend until they are evenly distributed throughout the mix. Using your hands, roll the mixture into small balls just a bit smaller than a golf ball. You should get 12 balls out of the mixture, depending on the size you make them. Place the balls on a parchment-lined baking tray or dish. Place in the freezer for at least 1 hour. Put the dark chocolate in a heatproof bowl and place over a pot of boiling water, making sure the bottom of the bowl doesn’t touch the water. Stir the chocolate until it has melted. Place the balls one by one into the melted chocolate, making sure you completely coat each one. Place back on the parchment-lined sheet and immediately sprinkle with your desired toppings. When all the balls are covered in chocolate and toppings, place back in the freezer, as you can enjoy them straight from frozen.